Popular Woodworking Magazine has gathered the top craftsmen working today to help you perfect your skills, particularly when it comes to joinery. 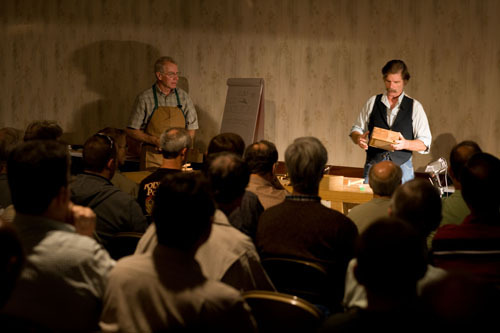 You’ll get up-close-and-personal with these legends of woodworking during hands-on sessions that answer all your joinery questions. Ajax Alexandre is the online community editor at Popular Woodworking Magazine. He likes to build furniture, jewelry and sculpture out of wood, metal, glass and found objects. Prior to joining the magazine, Ajax worked in the Textiles Department at Rhode Island School of Design. He has taught woodworking courses at UMASS- Dartmouth and RISD, including Japanese Joinery, Shaker Design, Furniture Design, and Three-dimensional Design, among others. Recently, Ajax founded Legacy Arts, a non-profit after school woodworking program in the Over the Rhine section of Cincinnati, with the intention of passing on woodworking skills to the next generation. Chuck began woodworking at the age of 12, and in his teens, he studied under a German Master who taught him the value and proper use of hand tools. After his formal training, he worked with two Chester County, Pennsylvania master furniture makers. Throughout his apprenticeship Chuck studied period furniture design and construction. For more than 30 years, he’s created masterpieces for clients throughout the country. Since starting his own period-furniture business is 1991, Chuck has been recognized as one of America’s top traditional craftsmen. His work can be seen in private collections, museums and some of the best juried craft shows in the country. Chuck opened The Acanthus Workshop in 2007, a Philadelphia area-based school that provides woodworking instruction to students of all levels. Chuck also teaches classes online through http://www.acanthus.com/category/nobswoodworking/. Graham was born and trained in London, and now lives in Woodstock, N.Y., where he built his first house more than 25 years ago. He's spent decades designing and making custom furniture. Besides serving as contributing editor to Popular Woodworking, editor of Woodwork and contributing editor to Fine Woodworking, Graham has written numerous books on all aspects of woodworking, from home building to cabinetmaking to hand tools. He was the television host of "Secrets of the Master Craftsmen," and was featured in Maxine Rosenberg’s "Artists of Handcrafted Furniture at Work" and Jane Smiley’s "Artisans of the Catskill Mountains." In addition to making furniture, and teaching across the United States, Graham also runs Blackburn Books, which recently published the highly acclaimed "Traditional Woodworking Handtools: A Manual for the Woodworker," and its sequel, "Traditional Woodworking Techniques." You can learn more about Graham, his videos, books and appearances at blackburnbooks.com. In his early 20s Brian Boggs discovered James Krenov’s books on “The Fine Art of Cabinet Making,” and found he could hardly put the book down. Then discovered John Alexander’s “Make a Chair From a Tree,” a simple approach to the early ways of greenwood chair-making. And that was it. He set up his first shop with $50 worth of old hand tools and made his first chair in the winter of 1983; a neighbor saw it, ordered a set for his gallery, and Brian has been making chairs ever since. Brian has taught chair-making to indigenous tribes in Honduras and Peru as well as craftsmen young and old in Canada, England and the U.S. He’s designed spokeshaves for companies in the U.S. and Canada, and engineered and built much of his own specialty equipment. Brian recently started the Boggs Collective, near Asheville, N.C., a creative environment that fosters the best in studio furniture making. You can read more Brian, the collective and the all the collective craftspeople at boggscollective.com. The grandson of an institutional spiral staircase craftsman, Charles (A.K.A the Rock'NChairman) a woodworker with over 30 years of professional experience who specializes in teaching and crafting sculptured chairs. His DVD, book and patterns instructional bundles have assisted woodworkers all over the world (including Moscow, Russia) in successfully building sculptured rockers and chairs. He teaches woodworkers at Rock'NChairman University located in Columbus, Georgia. Recently, he appeared on the Martha Stewart Show with a rocker and one of his student's rockers. He credits 30 years of public and private teaching experience and education (B.S., M. Ed., Sp. Ed.) in helping him learn to teach woodworkers who are passionate about their work. Adam Cherubini builds 18th-century style furniture using 18th-century tools and techniques; everything he builds is completely by hand. In addition to serving as contributing editor to Popular Woodworking Magazine, Adam is a professional cabinetmaker who has been twice recognized by Early American Life Magazine as one of the best traditional artisans in the country. Adam makes replica hand tools in the 18th-century style, in addition to furniture from the period. His Arts & Mysteries column for Popular Woodworking Magazine (and he’s now back as its regular writer) is an enduring favorite, and you can find more on his building and design philosophy on his blog. Megan Fitzpatrick is managing editor of Popular Woodworking Magazine, a position she’s held since the fall of 2004. As the owner of a late 19th-century house, she was well-versed in DIY projects before joining the magazine staff. Now, however, in addition to hanging bead board and framing out bathrooms, she also makes a lot of the furniture for her home (and taught others to do the same). Her favorite projects she’s built include a 9’-long dining room table inspired by Medieval joinery (there’s not one piece of metal in it), an 8’-tall Shaker stepback with raised panels that doubles as an entertainment center, a veneered demilune table and a modern chimney cupboard. Megan considers herself a “hybrid” woodworker in that she uses both hand and power tools in the shop – but her (current) favorite tool is her router plane. In her spare time, she’s working on a Ph.D. in early modern drama (a.k.a. Shakespeare), and is working toward specializing in furniture from the same period. Peter Follansbee began learning traditional woodworking in 1980 when he attended a John Alexander chairmaking course at Drew Langser’s Country Workshops in Marshall, N.C. He went on to take many courses at Country Workshops and gave away his power tools in the mid-1980s. Steve Hamilton, is a Virginia craftsman who is responsible for building many of the most magnificent pieces of our generation. He has participated in the building, finishing, and restoration of furniture found in some of the most prestigious private collections in the country. His work can be seen at Colonial Williamsburg, Carlisle House, Mt. Vernon, the White House, and the U.S. Parks Service, to name a few. He apprenticed with Mack S. Headley Sr. and has been a master builder with Mack S. Headley & Sons for 30 years. During that time, Steve has taught building, restoration, and finishing of fine furniture to four apprentices. Jeff Headley is a fourth-generation cabinetmaker in the family business of Mack S. Headley & Sons (not to be confused with Mack Headley Jr. of Colonial Williamsburg), which reproduces pieces of American furniture built before the 1820s. The Headleys' shop is located outside of Berryville, V.A., in the historic Shenandoah Valle. Jeff has written for woodworking magazines, demonstrated on Roy Underhill's "The Woodwright's Shop" and lectured to many organizations and museums, including Colonial Williamsburg. Jeff lives with his wife, Susan, in Clarke County, VA, between Winchester and Berryville, with their four dogs and three cats. Jeff also raises a small herd of Hereford and Angus cows on the family farm. Since taking over a nearly century-old extended family business in 1996, Ron Herman has continued the tradition as master house wright and carpenter for Antiquity Builders of Ohio. From his mill in Columbus, with its extensive inventory of period hand tools (and modern machinery), the trades are practiced to the highest levels. Whether felling trees or doing fine carpentry, hand tools play a vital role both in the mill and on the job site. Ron’s customer base continues to expand with those who want accurate, historical restoration – and a home to brag about. His company also does new builds. For the last decade he has worked with numerous historical societies and woodworking clubs to educated them in identification, care and proper use of 19th- and 20th-century woodworking hand tools. Ron has written articles on hand tool selection and use for Popular Woodworking Magazine, and is the host of the videos “The Joinery Challenge” and “Sharpen Your Handsaws”. Glen Huey is long-time professional furniture maker, author, DVD host and woodworking teacher who has been involved in the craft since he turned 14, some 38 years. His first major piece of fine furniture was a Sheraton bed that he still has to this day. Glen’s first published project appeared in Popular Woodworking in November 1997. After many years as a contributing editor, he joined the staff full time as a senior editor in 2006. In addition to building projects for the magazine, Glen headed up product testing and power-tool reviews. Recently Glen’s desires to be in the shop building period reproduction furniture got the better of him and he stepped down as a full-time member of the magazine crew to return to a role as contributing editor and to work on books, DVDs and commissioned pieces all while improving his furniture-building techniques. In today’s terminology, Glen considers himself a hybrid woodworker who leans heavily toward the power tool side. He embraces corded and battery-powered tools, but understands and uses hand tools when appropriate. In addition to his editorial duties, Bob designs and builds many of the magazines' projects and is responsible for many of the illustrations and measured drawings. Before joining the magazine in 2004, he spent more than 25 years designing and building custom cabinets and furniture, both in his own shops and in large commercial shops. During the last five years of this period, he served as project manager for a number of large commercial and residential projects, developing working drawings in AutoCAD and planning and supervising the fabrication and installation of custom cabinets and millwork. Robin Lee is the president of Lee Valley Tools Ltd., Veritas Tools Inc. (Canada), and Veritas Tools Inc. (USA). Robin has worked in all areas of the business over the past 35 years – from grinding castings during high school, working in retail store through university, and several management positions since joining the firm full-time in 1986. He holds multiple utility patents for woodworking tools, and is actively involved in tool design. He enjoys playing hockey, woodworking, and gardening, and is married with two children. Thomas Lie-Nielsen is the founder of Lie-Nielsen Toolworks in Warren, Maine, which specializes in making high-quality hand tools that are based on historical models, which the company has radically improved. Lie-Nielsen started his company 30 years ago in a farm shed and made every single one of the tools. Today he employs about 80 people and his company produces a full line of tools for the hand-tool woodworker. Christopher Schwarz is the former editor of Popular Woodworking Magazine and is now a contributing editor. A long-time amateur furniture-maker and hand-tool enthusiast, he began working with wood at age 8 when his family members built their first home on their farm outside Hackett, Ark., using hand tools because there was no electricity. After college, Chris became a newspaper reporter and studied furniture-making at night at the University of Kentucky. Despite his early experiences with hand tools on the farm, Chris remains an avid student and advocate of traditional hand techniques. Chris writes about hand tools for Popular Woodworking Magazine and The Fine Tool Journal and uses them every day in his own work (though he also uses power tools when they’re the logical choice). He has journalism degrees from Northwestern University and The Ohio State University and has worked as a magazine and newspaper journalist since 1990. He is the host of many DVDs on traditional hand tools and the author of several books including “Hand Plane Essentials” (Popular Woodworking, 2009) “Workbenches: From Design & Theory to Construction & Use” (Popular Woodworking Books). He teaches traditional hand work at the Marc Adams School of Woodworking, Kelly Mehler’s School of Woodworking and the The Woodwright’s School. He recently stepped down as editor to concentrate on his work at Lost Art Press. Steve Shanesy is the former Editor and Publisher Popular Woodworking Magazine and Books, and the Woodworking In America conference. Steve joined the magazine in 1994 as editor. In 2011 Steve stepped down from managing the business and returned to the editorial staff as a senior editor. Prior to joining Popular Woodworking Magazine, Steve worked in the furniture and cabinetmaking industry for 13 years. In the trade, he was a cabinetmaker and also managed small to medium-sized custom furniture and cabinetmaking shops in Los Angeles and Cincinnati. Steve graduated from Ohio University with a journalism degree and learned woodworking fundamentals at Los Angeles Trade Technical College. Roy Underhill, a former master craftsman at Colonial Williamsburg (and the living history museum’s first master housewright), is the host of the PBS show “The Woodwright’s Shop,” the longest-running how-to show on television. Since the show’s inception, Roy has championed the use of traditional hand tools and techniques and has featured guests ranging from well-known woodworkers including Michael Dunbar, Steve Latta and Frank Klausz, to specialist artisans in blacksmithing cooperage and more. He’s also written a number of books on traditional craft and shop practices, including “The Woodwright’s Shop: A Practical Guide to Traditional Wooddcraft” (UNC Press, 1981), “The Woodwright’s Apprentice: Twenty Favorite Projects from The Woodwright’s Shop” (UNC Press, 1996) and “The Woodwight’s Guide to Working with Wedge & Edge” (UNC Press 2008). Four years ago, Roy founded The Woodwright’s School, a small woodworking school in Pittsboro, N.C., that’s a step back in time – students must leave tape measures and cell phones at the door as they learn with the tools and techniques of the early 20th Century. Through his books, show, classes and live presentations, Roy has introduced thousands of people to traditional hand-tool woodworking. Roy is a member of the Society of American Period Furniture Makers and the Early American Industries Association. Jay van Arsdale apprenticed early on with his father and grandfather in his family’s blacksmith shop in Kentucky. After graduating from Centre College in Danville, Ky., in 1970, he moved to the Bay Area where he attended Mills College in Oakland, and earned his MFA in art in 1972. Jay was inspired tobecome involved in Japanese woodworking in the mid 1970s after seeing a demonstration by Japanese Daiku Makoto Imai, with whom he studied for a number of years. Jay has worked and taught in the Bay Area since the early 1980s. He’s given numerous demontrations and lectures for many museums and woodworking organizations. He is the author of “Shoji: Designing, Building, and Installing Japanese Screens” (Kodansha, 1986), the DVD “Introduction to Japanese Woodworking,” (1987) and other publications, and he’s appeared on television in the United States and Japan. Jay is the founder of Daiku Dojo/ wood joinery alliance – a community service learning Japanese woodworking group @ www.daikudojo.org. Don Williams is a Maryland and Virginia-based conservator, educator, author and finisher, and has over the past 40 years worked on preserving and restoring some of the most interesting objects in our nation’s public and private collections. He has written and taught on an array of subjects related to artifact conservation, woodworking and historical wood finishing. In his spare time he passionately pursues varied interests, including economics, metal casting, and homesteading. His current projects include the almost finished relocation/reconstruction of a 19th-century timber frame barn as a studio/classroom/command center at his remote mountain retreat (complete with its own micro-hydropower system), replicating the chairs of Samuel Gragg, building a japanned Queen Anne highboy, fabricating a classical style marquetry chevalet and the requisite collection of historically inspired workbenches, and publishing the annotated translation of J.A. Roubo's 1765 masterpiece "L'Art du Menuisier" and an exquisitely illustrated book on the H. O. Studley tool cabinet and workbench. Sign up for our e-newsletter and get all the latest updates. © Copyright 2011 F+W Media, Inc. All rights reserved.